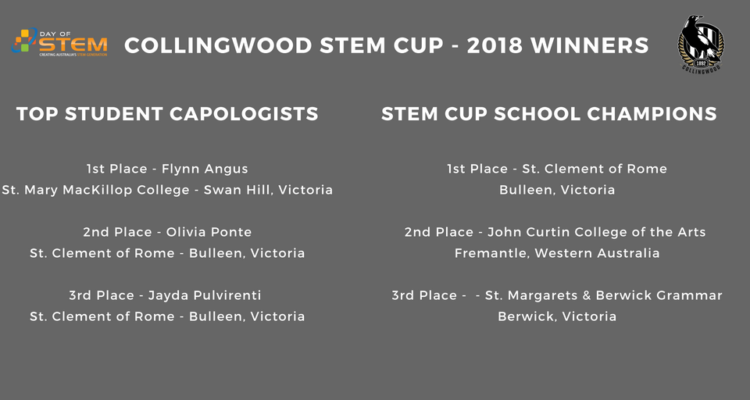 The Collingwood STEM Cup has been retained by inaugural champions, St. Clement of Rome, who also took home the silverware in the competition’s first year. Led by mathematics teacher, Alyce Lowther, the school had the highest average scores relative to the real Collingwood Magpies player salaries calculated by team Capologist Dominic Milesi. The top student capologist in the 2018 competition is Flynn Angus from St. Mary MacKillop in Swan Hill, Victoria. In addition to being a skilled mathematician, Flynn is also a talented footballer playing for his school’s club. Two female students from St. Clement of Rome, Olivia Ponte and Jayda Pulvirenti, took second and third place respectively in the individual competition. John Curtin College of the Arts in Fremantle, WA and St. Margaret’s & Berwick Grammar in Berwick Victoria finished second and third place in the school category. The top Capologists and Champion Schools will receive tickets to the upcoming Round 18 match when the Collingwood Magpies take on the North Melbourne Kangaroos on 21 July at the Melbourne Cricket Ground. Individual winners will receive some selected Pies merchandise for their outstanding achievement in the competition. The Collingwood STEM Cup program has been updated to reflect the latest Pies squad and the competition is open new entries. Participants must complete the program and submit their cap-table worksheets with player salary figures underneath the AFL salary cap.